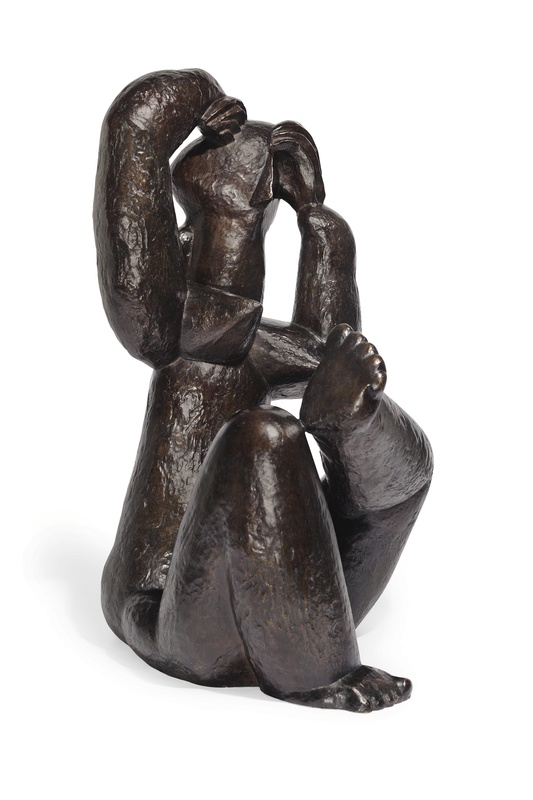 Charles Tabachnick, Toronto (acquired from the above, November 1982); sale, Sotheby's, London, 24 June 1997, lot 30. W. Hofmann, The Sculptures of Henri Laurens, New York, 1970, p. 218 (another cast illustrated, pp. 152 and 153). La Négresse is an elegant example of Lauren's development away from the angular rigidity of Cubism, towards the soft lines and elegant curves in his depiction of the female body. This development corresponds to his move to Etang-la-Ville from 1932 to 1933, and although he was certainly influenced by the voluptuous nudes of Aristide Maillol, a great friend who lived in the vicinity, Laurens developed his own distinctive manner of portraying the female form by combining organic volumes with energetic angles and curves and a sense of rhythm. The dealer Daniel-Henry Kahnweiler described this quality of Laurens's work: "The appearance of curvilinear forms in Laurens's work in no way signaled a renunciation of Cubism but was a part of normal evolution towards a new orientation" (quoted in op. cit.., p. 50). According to Guy Brett, "his later work is certainly more challenging than his Cubism. As soon as you see Laurens's sculpture you understand he was seeking sensuousness, a kind of fullness and roundness, which he never could have achieved within the geometrics of Cubism or dematerialized sculpture" (Sculpture and Drawings by Henri Laurens, Reading, 1971, p. 7). It was in Etang-la-Ville that his great marine themes, such as L'Océanide (1933) and Les Ondines (1933), first appeared. In these works Laurens looked to the personifications of the sea in Greek mythology for inspiration. He readily admitted that he was now more inclined to abandon himself to subconscious inspiration, starting a sculpture with only a vague idea of his intended imagery and giving the work its title on completion; Laurens's wife, Marthe, later recalled that he took daily walks in the forest for inspiration, representing the limbs of his figures knotted like branches and giving the surfaces the texture of bark. Like the series of bathers painted by Picasso at Dinard in 1928-1929 and in Boisegeloup in 1932 (fig. 3; Zervos, vol. 8, no. 147), La Négresse obeys only an organic rhythm, which swells or lifts, hollows or magnifies them in a joyful impulse. La Négresse was previously in the great Fauve and German expressionist collection of the Canadian collector Charles Tabachnick. This innovative collection successfully juxtaposed works from the two artistic movements, as superlative examples by Kees van Dongen, Max Pechstein and Ernst Ludwig Kirchner came together in an aesthetic celebration of energy and color. 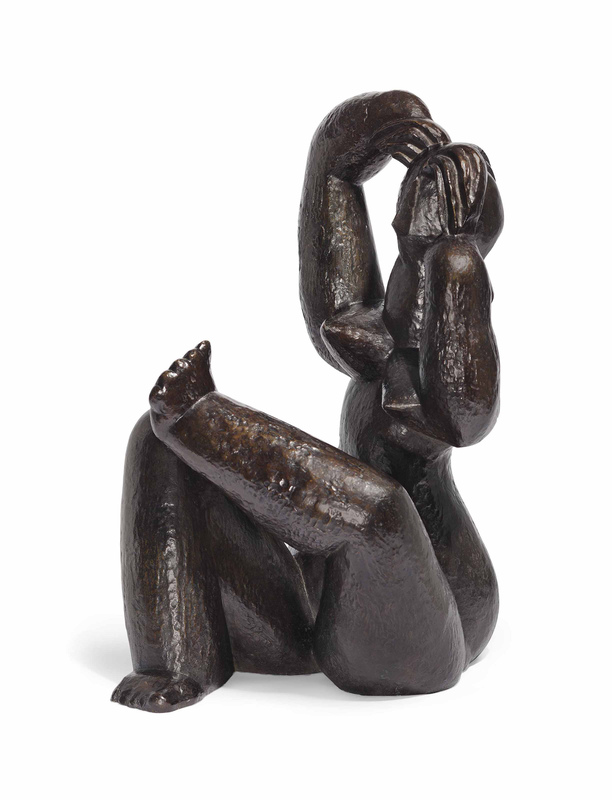 The Laurens bronze was amongst five sculptures in the collection, including a unique carved work by Ernst Barlach, a bronze by Georg Kolbe and a stone cast of Femme couchée by Laurens. (fig. 1) Pablo Picasso, Baigneuse au bord de la mer, 1933. Private collection.